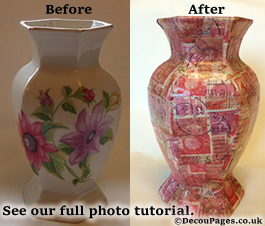 Decoupage (also known as decopatching or deco mache) is a simple way to revamp an old vase. This is an ideal project for a beginner because it is a simple shape. You'll need an old vase, decopatch glue-varnish, a small blunt ended paintbrush, enough decopatch paper to cover the vase plus half as much again (this is a generous estimate.) We used the Deco Mache Stamps design paper. If the vase is dark or patterned you will also need some acrylic white gesso primer. For a tougher and glossier finish you can use Aquapro varnish to finish. Click here to buy your essential Decopatch supplies. Make sure the vase is clean and dry. Apply a layer of acrylic white gesso primer to cover any pattern or dark colour that might show through the paper. Allow to dry. Tear the paper into large postage stamp sized pieces. Paint a thin layer of glue-varnish onto an area of the vase slightly bigger than the piece of decopatch paper. You'll quickly learn to pick up and position the decopatch paper with the paint brush. Smooth and seal the decopatch paper by painting a thin layer of glue-varnish over the top. Work your way around the vase, overlapping the paper slightly. The Decopatch glossy glue dries quite quickly, but you don't want it full of finger prints. Continue working until you have covered the entire piece. Don't forget to cover inside the throat of the vase. If you need to stop part way through wash your brush out and wrap in paper towel to dry it out. When dry you can coat with Aquapro varnish if you want a more glossy and highly water resistant finish. It also helps eliminate the slightly tacky feel you sometimes get, especially with non-porous surfaces. It really is that simple. You can also buy a wide variety of complete decopatch kits online.